Buffer is a powerful app that can take your social media posts and engagement to the next level. With Buffer, you can save both time and energy trying to handle all of your social posts manually. 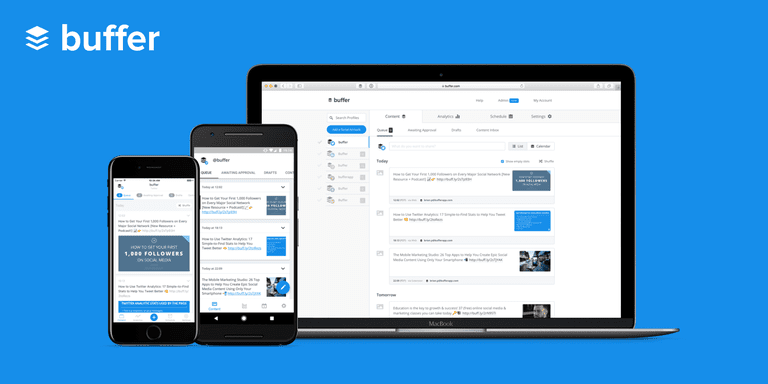 Buffer is a simple web application that allows you to schedule social media posts across a variety of popular social networks. It's basically a stripped down version of other popular social media management tools like TweetDeck and HootSuite, focusing mainly on post scheduling. Buffer is super easy to use, which is partly why it's so popular. When you connect a social network to Buffer, you can start composing new posts to add to your post queue. Your post queue is where all your scheduled posts live as they wait to be posted. Posting times are set up by default in your settings tab, which have been optimized for certain peak engagement times of the day (however you are free to customize these posting times any way you want). Every time you add a new post to your queue, it will be scheduled to automatically post to your account at each consecutive time. You also have options to share the post now or to set up a specific scheduled date and time for each new post that you compose. A powerful post composer: The post composer is media friendly, meaning that you can add links, photos, GIFs and videos to your posts through Buffer. Your own custom post schedule: You can customize your schedule so that queued posts are published any day and any time you want. Post statistics: Once a post has been published through Buffer, you can switch over to the Posts tab to see engagement stats such as clicks, likes, replies, comments, shares and more. The following reasons might convince you to start using Buffer for all your social posting needs. 1. You don't have to schedule every single post separately, making it a faster alternative to other scheduling tools. Rather than requiring you to select and set a specific time for a post to go out every single time you want to schedule one, you can just write a new post, add it to your queue and forget it! You also have total control over your scheduled times so your queued posts always post whenever you want them to post—right down to the minute. 2. You can schedule posts for five of the most popular social networks. Buffer can be used with Facebook (profiles, pages and groups), Twitter, LinkedIn (profiles and pages), Google+ (profiles and pages) and Instagram. Pinterest is a sixth social network you can use with Buffer only if you decide to upgrade. 3. Buffer's free plan includes a generous offering for any small business, brand or individual account. A free plan lets you connect up to three social network accounts and gives you unlimited scheduling with up to 10 posts per account stored in your queue at a time. For many small businesses/brands and individuals, that's plenty. You'll also get access to post analytics so that you can see how many clicks and other interactions you got on your posts. This will help you determine which posts perform well and which times of the day have the highest engagement rates. If you're going to use Buffer, it's important to have a good idea about when your fans and followers are the most active and the most likely to see your posts. Then you can build your schedule around those peak times of the day or week to maximize your social presence. Adding posts to your queue from Buffer.com is great, but believe it or not, Buffer has a few other options that make the process even faster and easier. 1. Use Buffer's browser extension to add to your Buffer without leaving the page. You can download official Buffer web browser extensions for Chrome or Firefox to add posts to your queue directly from a web page as you're browsing the web. All you have to do is click the Buffer icon in your browser to automatically fill and optionally add to a new post. 2. Use Buffer's mobile app to add to your queue from a mobile device. Buffer has dedicated mobile apps for both iOS and Android devices so you can easily add content from a mobile web browser or app to your Buffer queue. Just toggle the tab in your mobile browser or app that lets you access other sharing apps you have installed. The Buffer app should appear next to your other popular sharing apps. 3. Use Buffer with all of your favorite apps and web services: Buffer has been integrated with several popular apps and services so that you can add posts to your queue directly from those apps and services. From IFTTT and WordPress, to Pocket and Instapaper, you might be able to take advantage of Buffer integration with at least one tool that you already use! For businesses, brands and individuals who need to schedule more than 10 posts at a time and want to work with more than three social accounts, an upgrade might be worth it. Premium business plans also let you add team members to a single Buffer account so that you can collaborate on your social posts. A Pro plan at $15 a month gives you up to 8 social accounts and 100 scheduled posts per account while a large business plan at $400 a month gives you up to 150 social accounts, 2000 scheduled posts per account and 25 team members. So whether you've got a small local business or a huge marketing campaign to run, Buffer offers something for everyone.